Bise Kohat Matric result 2019 is now announced by officials on 04 july 2019. BISE Kohat Board SSC part 1 Result 2019 announcement date is now announced. 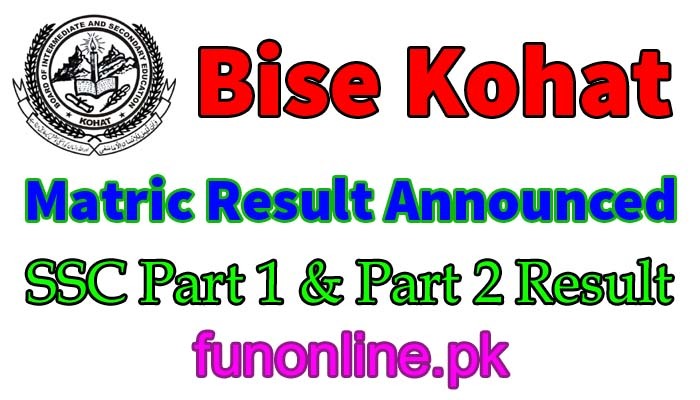 Bise kohat board ssc part 2 annual exams result 2019 check online and search by roll no is now available on official website. Board of intermediate and secondary education kohat have announced the complete result for all districts ie kohat, District Karak, Hangu, FR Orakzai agency and kurram agency. You can check online kohat board ssc result 2019 part 1 download. You can also check online your result by sms service and can get kohat board ssc part 1 result on their mobile. MUHAMMAD ASAD KHAN S/O MOHIBULLAH KHAN (CADET COLLEGE KOHAT), Roll No = 63625, Marks = 1030. IQRA NOOR D/O MUHAMMAD NOOR (COMPREHENSIVE GIRLS MODEL SCHOOL & COLLEGE DARRA ADAM KHEL F.R KOHAT), Roll No = 58555, Marks = 859. RIFFAT REHMAN D/O SAIF UR REHMAN (SHAHEEN PUBLIC SCHOOL DARRA ADAM KHEL F.R KOHAT), Roll No = 58531, Marks = 858. ANEESA S/O MAJID ULLAH (COMPREHENSIVE GIRLS MODEL SCHOOL & COLLEGE DARRA ADAM KHEL F.R KOHAT), Roll No = 58556, Marks = 858. MAIRA D/O HIDAYAT ULLAH (SHAHEEN PUBLIC SCHOOL DARRA ADAM KHEL F.R KOHAT), Roll No = 58533, Marks = 858.